Living in downtown Toronto was a great adventure. If a city can be credited for expanding my taste buds, this was it. For four and a half years we explored a few of its many Chinatowns, the Greek district, Little Portugal and the melting pot that was Queen Street. All within walking distance or a subway ride from our condo. We ate out a LOT. Husband jokes that every maitre’d in the city knew us a “the couple without a kitchen.” The cooking bug had yet to take hold, but I like to think of this as my “research” phase. Part of the appeal was a waiter named Scott. We always sat at one of his tables if we could, and took good care of him for taking good care of us. 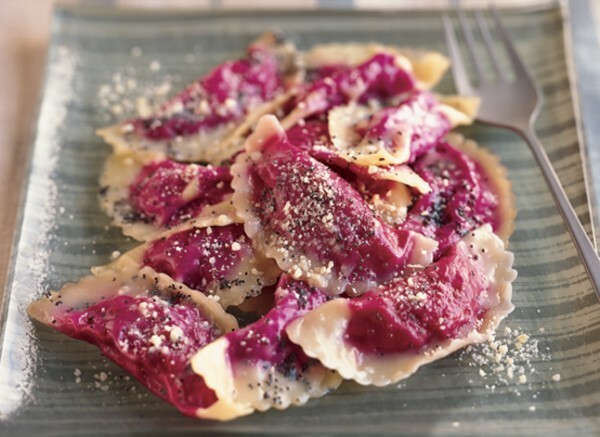 My go-to dish was the decadent and delicious Beet Ravioli, topped with some browned butter and poppy seeds. I rarely ordered anything else. After work on Valentine’s Day, 1995 we stopped in for an appetizer and drink at the bar. The place was already buzzing. Scott asked if we were staying for dinner, but we didn’t have a reservation, nor were we that hungry. An hour later he asked again, and again we said no. Eventually, he came by AGAIN and said he had a table for us — he thought we should stay and take it. While a sweet gesture, it was a little odd. Really — we WEREN’T hungry! But something about his insistence swayed us, and we moved our cocktails and our selves to a little table by the window. It was right next to another little table by the window, that had gone unoccupied since we walked in. Again, odd… they’d turned every table in the restaurant at least once since we’d been there — except this one. Shortly after 10, the mystery of the empty table next to ours — and Scott’s odd insistence that we stay, was solved. In walked Elizabeth Hurley and Hugh Grant. It was impossible not to steal regular looks their way. First, it was a small restaurant, and my elbows were nearly touching hers. Second, she is breathtakingly beautiful — without a stitch of makeup. And Hugh Grant? He’s got more charisma in person than on the big screen. We resisted the urge to start a conversation — after all, it was Valentine’s Day. But when one of the guys dropped his coaster on the floor, they both went for it at the same time. And thus began a fun chat that lasted until well after 11. They talked about wanting to visit other cities in the US besides New York and LA; she was intrigued by our love of the mountains, learning to fly-fish and yurts. I recommended the Beet Ravioli. They were both incredibly charming. Finally, they headed to a midnight movie, and we headed home. And Scott? He got a rather large tip that night! 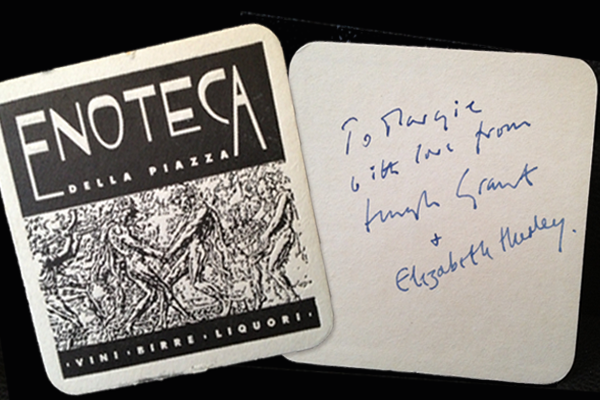 The coaster that started the conversation. They signed it for my sister. Arguably the hottest spot in Toronto in its hey-day, Prego closed its doors after 23 years in 2010. I’ve had to learn how to make my own beet ravioli — and have come pretty darn close to theirs. But that Valentine’s night can’t be replicated. Preheat oven to 400°F. Wrap beets individually in foil; place on baking sheet. Roast until tender when pierced with knife, about 1 hour. Open foil carefully (steam will escape). Cool. 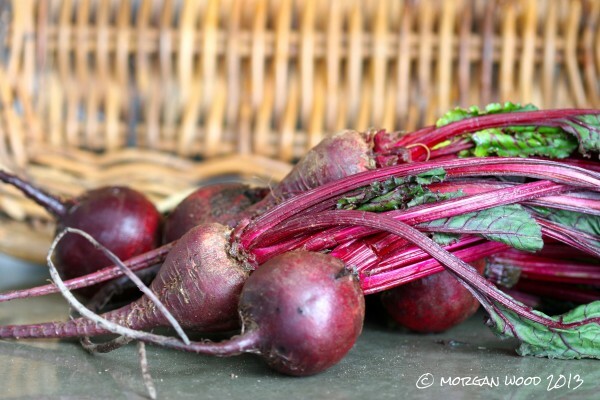 Peel beets; finely grate into medium bowl. Add ricotta cheese and season to taste with salt and pepper. Stir in breadcrumbs. Cover large baking sheet with parchment. Prepare a small bowl of water. Melt butter in large skillet over medium heat and stir in poppy seeds (Optional: use ¼ cup butter and ½ cup white wine to cut down on fat); keep warm. Working in batches, cook ravioli in large pot of boiling salted water until cooked through, stirring often, about 2 minutes. Using slotted spoon, transfer to skillet with melted butter; toss to coat. 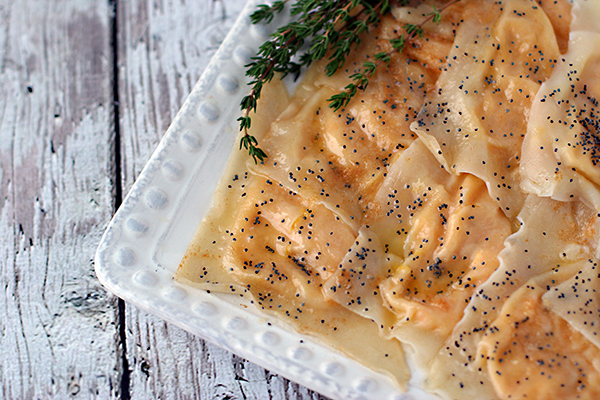 Divide ravioli among 8 plates; sprinkle with Parmesan and chives. NOTE: The original recipe calls for using Fresh Egg Pasta dough and rolling it out into sheets then cutting with a dough cutter. While nothing beats homemade pasta for taste, the simplicity of using wonton rounds makes this version lots more approachable! Don’t even consider using canned beets. Roasting these little jewels is super easy, and the flavor, color and texture is infinitely better than canned! do I dare? Jim loves beats. Will let you know. These are SO easy! Made them yesterday and had an early Valentine’s dinner last night. Simple and delish.